Though this is a prequel, it's one that I read after Through the Ever Night. 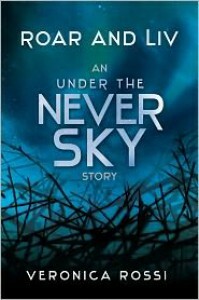 This is a heart wrenching story, one that you learn a bit of by reading Under the Never Sky and one that unravels even more in Through the Ever Night. AND IT WAS EVERYTHING IT SHOULD HAVE BEEN.Like Through the Ever Night, Roar and Liv induced much flailing. Roar is such a fun character in Under the Never Sky--but he becomes even more integral to the story in Through the Ever Night, which only makes HIS story that much more fascinating.I like Roar. A lot. And despite this being Roar and Liv, this is all Roar. Liv is still a bit unreachable to us--we experience Roar's emotions toward her and we like her because Roar does, not necessarily because we've had time to become attached. But that doesn't really matter because, you guys, IT'S ROAR.If you've read any of the books in this series, you'll want to read Roar and Liv. It had me wanting to pick up Through the Ever Night AND READ IT ALL OVER AGAIN. Roar and Liv was heart breaking, yes. But it was good. So, so good. And it covers some of the events that are referred to in the series. What are you waiting for? Go read it!